Christmas is so near I can almost taste the gingerbread man! But besides that… this marks the start of holiday promos! Shoppers are all geared up for the Christmas rush, roaming around stores looking for the best gifts within budget. I haven’t started Christmas shopping—and I know I should already. But anyway, I’d like to share some shops/stalls you could check out if you’re looking for reasonably priced items that would make for great gifts. I know it’s tricky to buy from online shops. It took me five months of just looking at them before I actually made my first purchased. I read reviews, comments and blogs first before I did. So to help the doubtful ones a bit, here are some worth checking out. I’m an accessories gal, so don’t be surprised that I’m sharing online accessories shops! Anagon Collection—Ana, the owner of the shop, is one of the most friendly online shop owners I’ve met. I’m the type of buyer who prefers to do meet-ups instead of bank transactions not only for its convenience, but because I want to see who I’m dealing with. Ana is actually a fashionista herself who, despite fighting the battles of Metro Manila commuting, still hands your order to you with a smile… while sporting cute outfits! No wonder she is the Fashionista Commuter. The items are quirky, hip, unique and affordable! Her items are normally limited in stocks, so it’s highly unlikely that everyone’s going to have it. She also does made-to-order items, customizing accessories according to your liking. I’ve had a ring done already, and it’s one of my favourite accessories. Earcouture—A recent discovery I’ve had the past weekend, while I was browsing through another online shop. Apparently, the owner, Joanna, owns both shops (the one that I was browsing through and Earcouture)! I haven’t made a purchase from Earcouture but I’ve already picked out ones I might want to buy. I assure you, though, that Joanna can be trusted as I’ve already bought from her other online shop, Mad Passion. Earcouture, true to its name, focuses on earrings. The items are elegant, classic, and can definitely add some jazz to any simple outfit. The prices are also cheap… with only 50 pesos, you can already have yourself a nice pair of elegant dangling earrings! On a recent trip to Robinsons Place Ermita with RC, we stumbled upon a stall called Swell Stuffs. It’s a small stall in front of CD-R King. I’m not familiar with RP, so I can’t give you the exact location. But we were walking from Pao Tsin when we saw it. There were a lot of adorable things. Even as we were already walking past it, my eyes were still glued in wonder, so RC asked me if I wanted to check it out and we did. 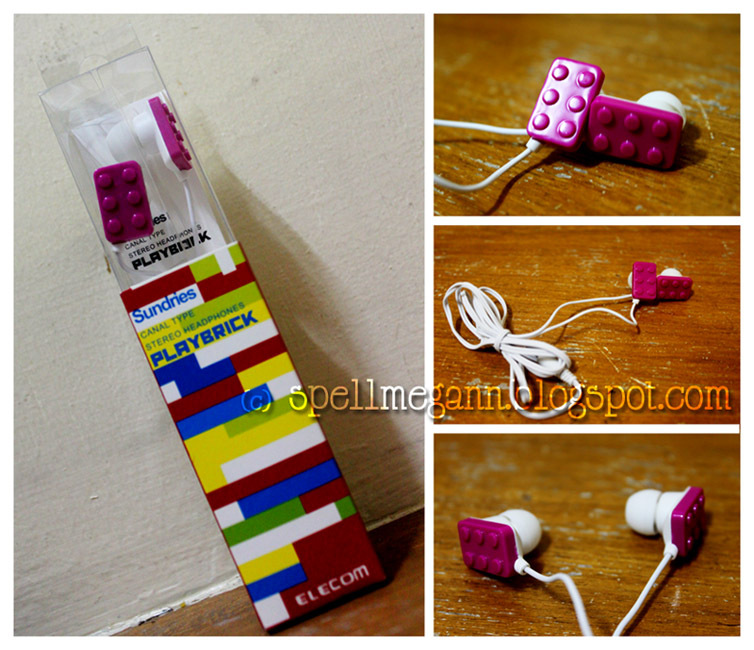 Browsing through the stall, we found these cheaply-priced lego-shaped earphones! Swell Stuffs has many other items on their rack! It's a small stall filled with very cute items. They have donut-shaped keychains and mirrors, robot-shaped coin banks, differently designed earphones (aside from Lego, they have Mickey Mouse-shaped ones, the regular ones in different colors, and even animal-printed ones! ), and quirky USBs, only to name a few. They really have a lot of interesting items that would sure be worth your time looking at! And the best part? IT'S ALL AFFORDABLE! And while we're on the topic of affordable finds, let me share with you my little business. Since I'm trying to save up for Christmas, I've decided to take on a business path! I'm selling Belle de Jour and Navi 2011 planners! The Belle de Jour costs P570 (mall price: P598) and Navi 2011 costs P500 (mall price: P520). If you're interested, let me know. I have more pictures up on my multiply; feel free to view - HERE! @ PAOLA - I didn't. I'm re-selling them, but I get the stocks from the company itself. :) They authorize people to resell eh. Buy na hahaha!